I know it’s fashionable to berate Valentine’s Day as an over commercialized trainwreck, but you know what? I kind of like it. Though I’m lucky enough to have someone I love to share it with (and believe me, I know that helps), what I really like about the holiday, despite it being a shallow capitalist ploy to get us all to buy crappy candy & cheesy cards, is that it puts love on the calendar. Granted, most of what our culture has to say about love is sad, scary, dangerous crap (hello, song lyrics & “romantic” comedies)—but does that mean love has to become a bad word? I hope not, because that thing called love keeps blowing me away. Real love, that genuine, below-the-surface, heart-full-to-bursting stuff, is the most extraordinary thing I think we, as human beings, get to experience. Here’s what I love about love: it’s the best teacher I’ve ever had. Just when I have stuffed the world back into its custom-sized box, contained and understood, safely put away where I might observe and manipulate it…love reminds me that there are approximately 8 zillion things possible in this life of which I can barely even conceive. Each time I get to a place where I think I know love’s dimension, understand the various ways it can work, can drive people mad, can knock us on our asses and humble us and transport and expand…then suddenly, a whole new layer unfolds and I’m stunned all over again. Love is the one thing that will actually push me to be the person I want to be. My love for Jill has forced me to expand, to be so, so much bigger and calmer and compassionate than I ever was before I met her. My love for my mother has brought me to moments of unselfishness and grace that fly in the face of my barest, basest self. These brownies are named for a man I hardly know. Greg and his wife Sharon are friends I made via Twitter, if you can believe it, and whom I have grown to love in a way that really doesn’t make sense. Sometimes it works that way, mysteriously. Loving someone else takes the much-too-bright shine off of our own imperfect lives for a little while. I’ve baked these brownies for Greg twice—once on his birthday, once following his mother’s death—and both times, the gesture usurped and created a level of intimacy beyond what we had established at that point. So now, every time I make brownies, I think of Greg. Whether I’m making them for their namesake, or to go into a care package for Dave’s family, or for my colleague Steve (with leftover dulce de leche swirled in), or to finish off a dinner party for Jill’s visiting friend, my circle of concern grows in the process and, for a while, it isn’t all about me. When I throw myself into a bowl of puddled chocolate and butter, when I will myself towards care and comfort with every spatula turn, then I’m a little bit closer to mirroring love and its infinity inside myself. The key to great brownies is great chocolate. 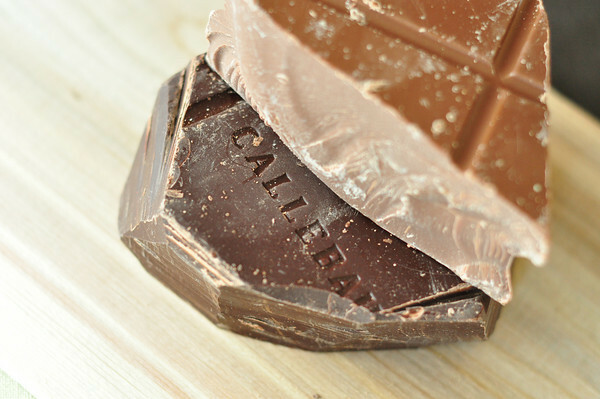 Personally, I have become obsessed with Callebaut, which I am lucky enough to be able to buy in bulk at a few different specialty grocers here in town. I can’t say enough good things about springing for fancy baking chocolate, especially if you’re able to find it in large blocks like the ones pictured here. The price-per-ounce winds up being MUCH cheaper than purchasing chocolate in chip or bar form. And as long as you keep any leftover chocolate wrapped in plastic & tucked into a cool, dark pantry, you’ll be able to keep it on hand for months. Please do not put it in the refrigerator! You can also order lots of great chocolate online—given how cold it is in most parts of the world right now, you won’t have to worry about it melting. However, if you’re in a rush or just aren’t up to my level of chocolate-obsession, buy some Ghirardelli at the very least. Nearly all grocery stores now carry it, and I cross-my-heart swear you’ll never go back to generic chocolate again. This recipe is my fail-safe, with the coffee & vanilla flavors nicely highlighting the chocolate-y-ness of the chocolate (yes, that’s a technical term) and the chili powder adding just a little something extra. You can obviously switch in other flavorings, like orange or almond, and leave out the chili if it makes you nervous. As for texture, I’ve gotta have nuts. Walnuts are most traditional for brownies, though pecans work nicely, too. Extra chocolate is never a bad thing in my book. But you could also toss in toffee bits, coconut, white chocolate chunks, etc. First things first-line that baking pan with foil. Using two sheets (one going in either direction, like a + sign,) be sure to leave plenty of overhang on either side. Spray the inside of the foil with baking spray. Melt the chocolate and butter together in a large bowl. Personally, I like the convenience of the microwave—just work in thirty second increments, stirring regularly to prevent burning. Of course, you can also use a more traditional double-boiler (a.k.a heatproof bowl set over gently simmering water). Once the chocolate and butter are melted and mixed, stir in the Kahlua and vanilla. Set aside to cool down a bit. In a separate bowl, beat the eggs and sugar together vigorously. Add to the chocolate mixture and mix thoroughly. Sift in the flour and pinch of salt. Toss in the chopped chocolate & walnuts, then fold all that goodness together. Scrape the brownie batter into the foil-lined pan, then slide the pan into the oven. You will need some toothpicks & also, some patience. I recommend you begin toothpick-testing at minute 30, plunging a toothpick into the very middle of the brownie pan. Since these are fudgy brownies, the toothpick doesn’t need to come back completely clean, but it shouldn’t be covered in batter, either. Remember, be patient! Depending on the temperament of your oven, the brownies will take 35-45 minutes. Cool on a wire rack for at least ten minutes. At this point, you can lift the brownies out, using the foil overhang, and cool them further. I know it’s hard to resist, but they really are much easier to cut if you wait at least 20 minutes. If you must dig in, however, who will blame you? Not I. And not Greg, I’d wager. That’s the most eloquent defense of love I’ve heard in a long time. And the best advocacy for it. It is about family and friends and sometimes friends you only know online. Thanks for sharing and happy Valentine’s day. I love you, Nishta, and you have just about convinced me that I need to make these brownies–though I lack your artist’s touch when it comes to the culinary. I will say it once this year without sarcasm, and i will say it now: Happy Valentine’s Day to you and Jill. Be well. Nice post, honey! And I have to say that these brownies are the best I’ve ever had. 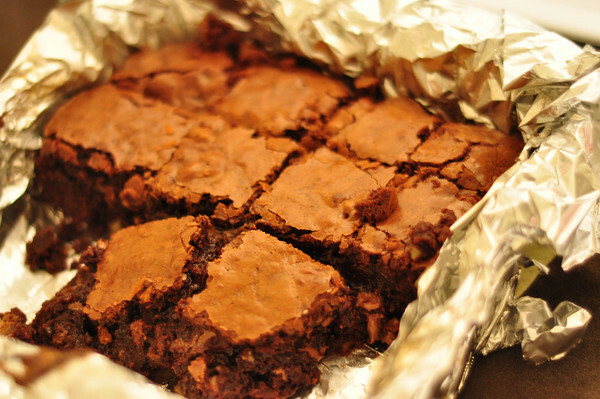 I don’t really like most brownies and I’m not a sweet-tooth person, but….these are a different story. They are light & fluffy, almost cakelike – not gummy and ooozy, like others I’ve had that I didn’t like – yet they are rich and decadent. I highly recommend these brownies. I don’t hate Valentine’s Day… I just hate that it’s a bad experience for a lot of people due to the restaurant crowds. I’d rather celebrate love privately 🙂 A and I are making dinner at home — I think we’ll add these brownies! I love the shot of the chocolate bars. It reminds me that I need to make truffles!! That brownie recipe sounds complex and delectable! Blue Jean Gourmet, I have a question. Are you going to give up anything for Lent? I was thinking about giving up sweets but then I can’t make these brownies until Easter . . . .! Anyway, you always wrote beautifully about spirituality/challenging yourself and how that relates to food so I was wondering! Will the great Nishta be sacrificing anything for 40 days?